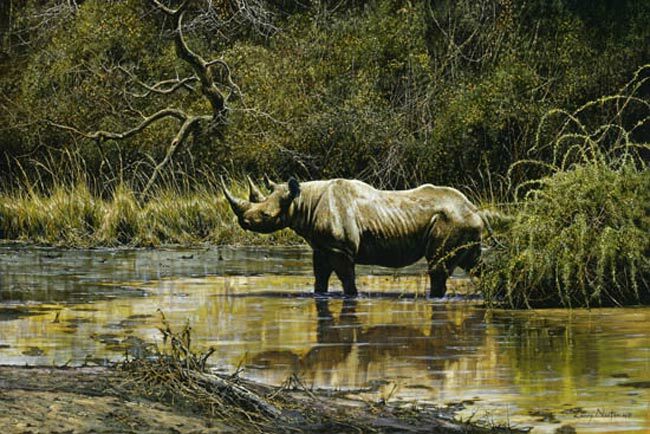 Larry is an internationally recognized African Wildlife artist who was born in Zimbabwe in 1963. He grew up on a farm in the north east of the country. 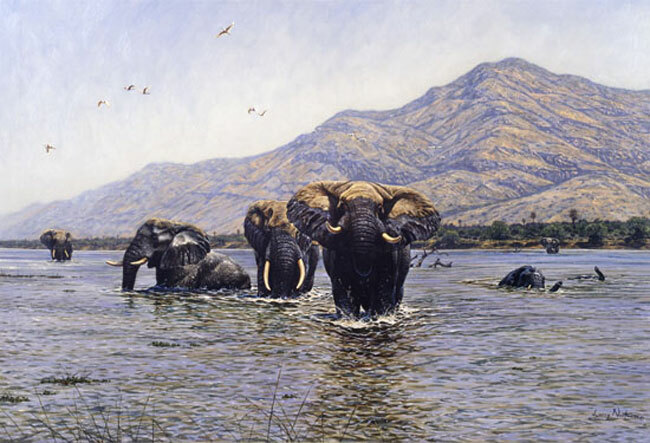 His early interest in painting continued while studying for an agricultural degree in Australia and later, while working as a white water rafting guide on the Zambezi River. In 1988 he began a professional painting career and since then he has exhibited around the world including several exhibitions in New York, London, Austria, South Africa and Zimbabwe. Larry Norton works in oils, water colour, charcoal and pencil and specializes in Wildlife art and African landscape especially Victoria Falls. Larry ‘s art is displayed in museums throughout the world and has featured in many books. 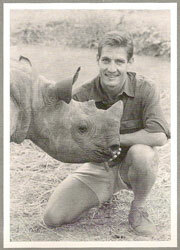 He is deeply involved in various fund raising activities for charity including his current drive to raise money for Hwange National Park. Larry and I met in 1985 when we were both white water rafting guides. 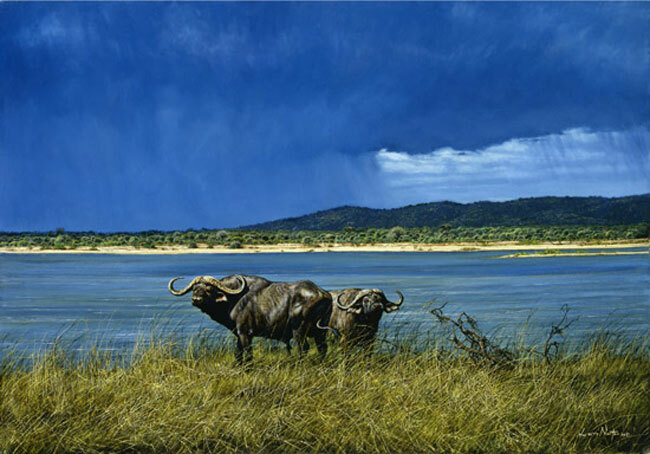 He works from his home studio in Victoria Falls, Zimbabwe, and travels extensively on field trips all over the world to gather material for future paintings. We remain friends after all these years and he has agreed to let me sell some of his art on our website. 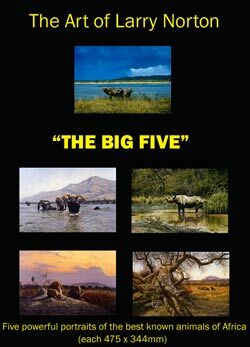 This Larry Norton set of the Big Five is presented in this beautiful glossy presentation folder shown below. 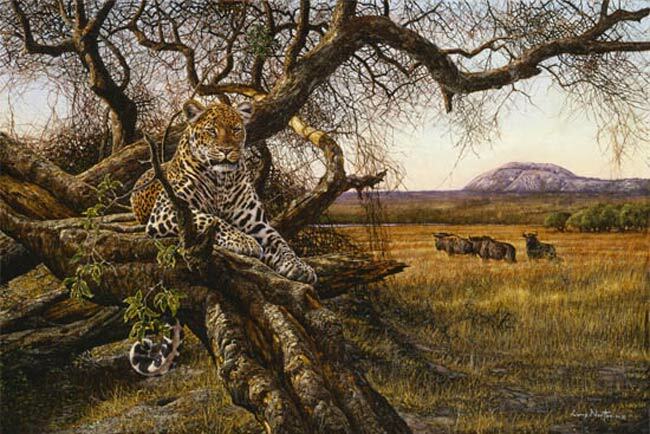 There are five individual prints of the best known African animals superbly reproduced on fine card each one 475 x 433mm. The original oils of these prints sell for about £12000 to £15000. They are spectacular. If you would like to order a set of these wildlife art prints please fill in the order form below and we will respond to you with postage and payment details. Below are the Five Superb Paintings featured in this set. Click on the images below to enlarge them. A phalanx of seven elephant bulls cross the deep currents of the Zambezi River. Elusive to the end, we occasionally found signs of Leopard on our farm. The mysterious guest is depicted here in the same tree where he had been sharpening his claws. 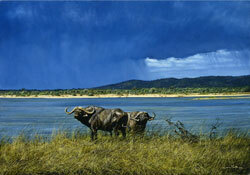 A pair of Buffalo Bulls are set against leaden waters reflecting a February storm. Unsettled by the wind and the weather, the Buffalo become as agitated as the sky above. 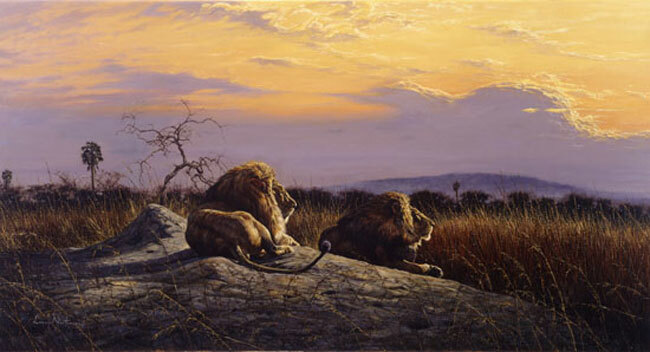 As dawn breaks over the Zambezi valley, this magnificent and regal pair take stock of their territory. Mist skirts a distant hill and the Illala palms rise out from the riverene forest, all subjects in a lorded land. Below is an order enquiry form and not a payment page. Once you have filled in the details below we will contact you via email and give you postage costs and Payment details. Thank you. Most of Larry's work today is through commissions. If you would like to get in contact with him to commission a special painting for yourself please contact us and we will be able to assist you.